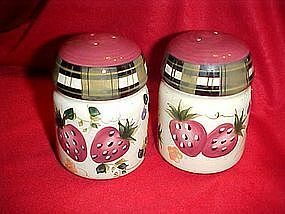 Nice large set of shakers by Oneida. They measure 4 1/4" tall and are made of hand painted glazed ceramic. They have strawberry, grapes and blueberries with flowers. (Photo just shows the strawberry side) Green plaid trim and burgundy tops. Plastic stoppers. Pristine condition.